Ego borago gaudia semper ago. I, Borage, always bring courage. The blue flower of the courageous Borage was embroidered onto the clothing on knights going off to battle to protect them and strengthen their resolve and worn in buttonholes to the same effect. Spike the tea of the one who you wish to propose to you with Borage to infuse them with the courage to finally ask. Known also as Cool-tankard, the flowers were used in drinks for their cooling effect before ice was a widely available and used commodity. A tea will induce psychic powers as well as improve one's outlook in life. Borage can be, in many ways, the "shining armor" we need to assume our warriorhood, reclaim our lives, and our sense of self. 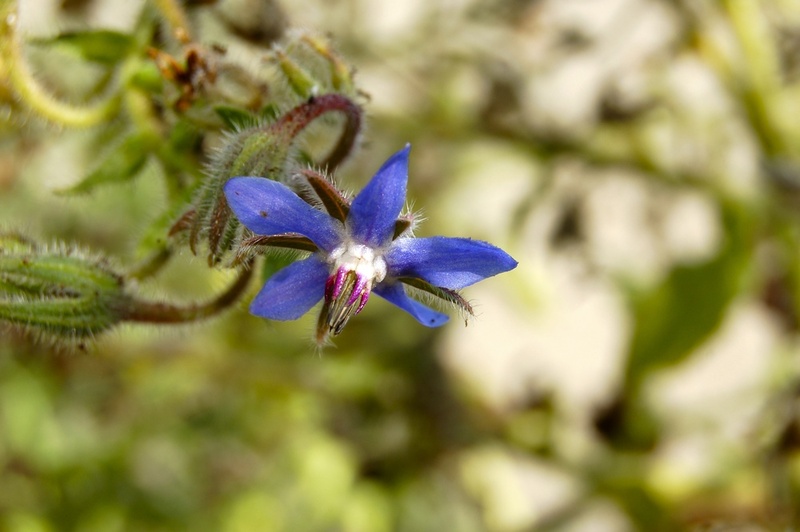 For those who are suffering nervous exhaustion, especially "menopausal women who are overworked and totally exhausted," but any person who seems to be suffering from adrenal burnout and is emotionally spent will benefit from Borage. (1) Borage has an uplifting and lightening affect that is a wonderful remedy for despondency and those who might say often, "I just can't take it anymore" but aren't entirely sure who "I" is or what it is they can't take. Borage is an herbal ally that strengthens the will and the knowing of self, reinforcing crumbling boundary walls and infusing the spirit with the brilliant hope that comes from uninhibited courage. Borage is of course useful for depression and I am especially fond of using it for depression that situates itself during transition periods: the postpartum periods, departures (such as leaving home or college or going off to war), and general life passages that require us to look honestly at who we are and what we are doing. The shift that Borage is particularly good at triggering in persons of a melancholic persuasion is the ability to love what we are responsible and accountable to which may mean a reassessment of priorities to be able to come to that emotional space. Externally, Borage is good for dry skin as well as rashes, eczema, varicose veins, and can be used as an eyewash for irritated and inflamed eyes. The flowers are delicious and can be added to salads and drinking water. (1) Rosari Kingston, MNIHM as cited in Wood, Matthew. The Earthwise Herbal: A Complete Guide to Old World Medicinal Plants. Berkeley, CA: North Atlantic, 2008. (2008): 146. Clever ones, I no longer sell my herbal teas and remedies such as my Hogwarts House Teas... but sign-up for my Magick Mail to keep updated on when I'll be releasing the recipes for each blend to the public! We are delighted to introduce our new line of Hogwarts-inspired House Teas to those lovely Muggles, Witches, and Wizards who shop the Apothecary. It is no secret that we're fans of the magical world of Harry Potter, Hermione Granger, Ron Weasley, and have spent many an hour dressed up as Professor Trelawney and dreaming of having a copy of One Thousand Magical Herbs and Fungi by former Hogwarts Headmistress Phyllida Spore. Hopefully our new Hogwarts House Teas will inspire the student of magic in you! Our Gryffindor House Tea features herbs that evoke courage, bravery, and hopefully grant a bit a luck to those daring individuals whom the sorting hat has placed in Godric’s house. DANDELION LEAF Taraxacum officinale: The jagged shape of the leaves has inspired Dandelion’s association with Gryffindor’s bold mascot. The leaves are extremely nutritious and are used to treat a large variety of ills – just like our brave Gryffindors who face all manners of challenges. BORAGE Borago officinalis: Borage is the plant of courage, strengthening the heart with resolve in face of the unimaginable. BASIL Ocimum basilicum: The origins of the name Basil comes from the Greek basilikon phuton, meaning “valiant” and “kingly.” While Ron may wish to forget his time as “king,” all Gryffindors would probably appreciate being recognized as valiant. SARSPARILLA Smilax ornate: Sarsparilla has an almost bubbly-taste and was added for the essential ingredient of love that keeps strong the will of Gryffindor. The loyalty of those of the House of Hufflepuff cannot be matched. They’re a grounded bunch, too, not getting carried away by big ideas but remaining focused on the here and now. The Hufflepuff House Tea is a combination of the practical and enchanted. CARAWAY Carum carvi: Carried between friends and lovers as a promise to fidelity, Caraway embodies the steadfast loyalty of Hufflepuffs to the people and causes they love. HAWTHORN Craetagus monogyna: The Hufflepuff mascot, the badger, is fond of the magical hawthorn, and so we imagine the Hufflepuffs would probably be, too. LICORICE Glycyrrhiza glabra: Licorice has traditionally used in tea blends to harmonize the energies of all other herbs involved. Hufflepuffs often seemed to do just that throughout Hogwarts, reminding folks of what really mattered. CHICKWEED Stellaria alsine: Another herb of steadfastness, Chickweed’s Latin name reveals its relationship to the celestial kingdom, lest we forget the truly unique brightness of a house that accepts any student as long as they are hard-working and loyal. Refinement, learning, and an ever-cool disposition, the Ravenclaw House Tea honors the grand history of tea drinking with the classic Early Grey while staying true to innovation with the addition of gingko, lavender, and peppermint. Contains caffeine. LAVENDER Lavandula officinalis: Blue to honor Ravenclaw’s house color, Lavender is a keep-it-cool herb that will help to settle any studying nerves. Not that those clever Ravenclaws ever lose their nerve. GINGKO Gingko biloba: A renowned brain tonic, our Ravenclaw blend would not be complete without nourishing their greatest source of talent. PEPPERMINT Mentha piperita: Fresh and invigorating, Peppermint stimulates new ways of working out solutions to the trickiest N.E.W.T. exam questions. The green brew of the Slytherin House Tea is a compelling blend of ancient herbs, snake charms, and the ambitious drive to gain the most while sacrificing little by way of purity. HORSETAIL Equisetum arvense: To play a whistle made from the stem of the Horsetail plant, is to be able to call and charm Slytherin’s mascot, the snake. Horsetail is an ancient plant lending itself well to a House preoccupied with ancestry. NETTLES Urtica dioica: Salazar Slytherin, the founder of Slytherin House, felt particular anxiety around the admission of the Muggle-born into Hogwarts. So you find Slytherin to be predominantly “pure-blood” students and in their House Tea, the blood-purifying Nettles are included. LEMON BALM Melissa officinalis: There is always a bit of a nervous, somewhat sour edge to Slytherins, so Lemon Balm adds a hint of sour while soothing the nervous thoughts of ambitious witches and wizards. HIBISCUS Hibiscus sabdariffa: Known also as sour-sour, the blood-red of Hibiscus adds to the pure-blooded, puckering tendencies of the Slytherin stock. Our Hogwarts House Teas can be purchased individually or as a Remedy Kit in our S H O P.